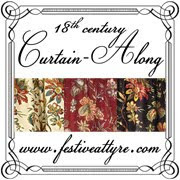 For the Festive Attyre Curtain-Along project, I made a 1750’s sacque, petticoat, and stomacher. The bodice lining was a modified version of the Simplicity Pirates of the Caribbean gown (S4092). I adjusted the armscye shape a bit to make it more accurate. I also moved the side seam back further, again to make it more accurate. I omitted the lacing because I didn’t feel like fooling with it this time around. I knew it should fit reasonably well since it had been fine when I made my celadon sacque a few years ago. The sacque itself was draped on the dummy following the tutorials on The Fashionable Past (http://koshka-the-cat.blogspot.com/2011/03/draping-sort-of-sacque-part-one.html) and patterns in Patterns of Fashion: The Cut and Construction of Englishwomen’s Clothes 1660-1860 by Janet Arnold – the 1745-1755 sack for wide hoops on pp. 32-34 and the 1745-1755 pet-en-l’air on pp. 28-30. 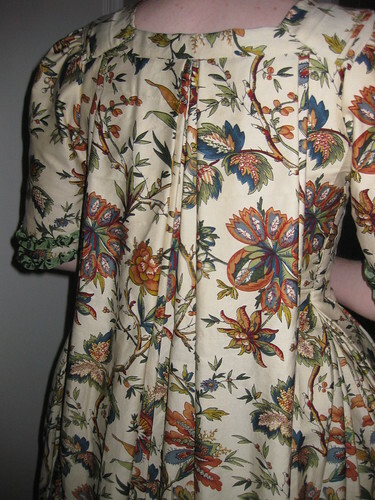 The sleeves were taken from the 1770-1775 sacque on pp. 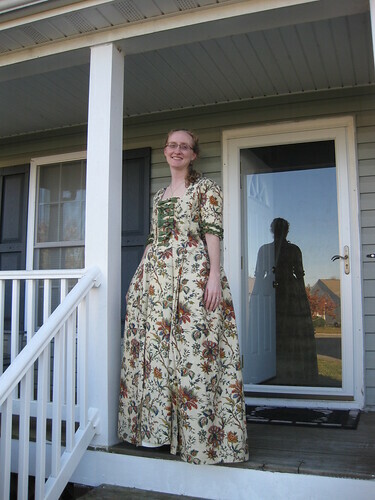 34-35, mostly because I already had that pattern piece printed out from last year’s rust taffeta en fourreau gown. 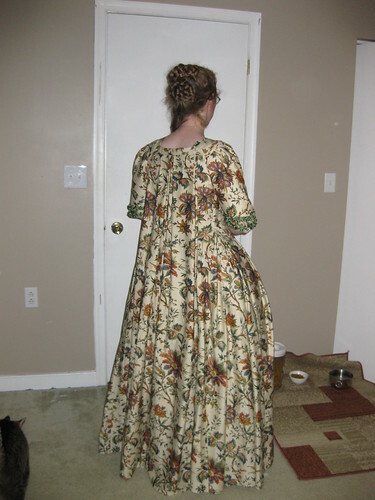 The petticoat was the same as my rust taffeta petticoat from last year, which used the 18th century petticoat tutorial on Katherine’s Dress Page. This tutorial is similar to the petticoat tutorial on A Fashionable Frolick except that it also covers waist shaping. The stomacher is just cut to a pleasing shape. The sacque, petticoat, and stomacher are made of indienne print cotton sateen. 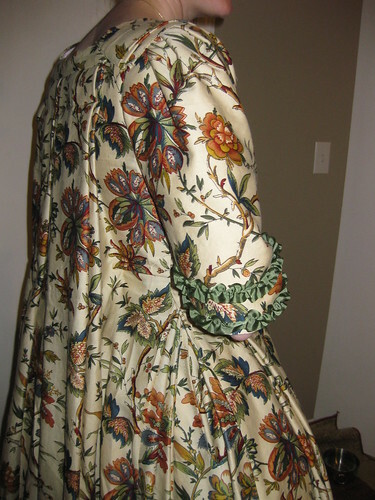 The bodice, sleeves, and stomacher are lined with muslin. The sleeves are trimmed with two rows of ruched china silk ribbon, and the stomacher is trimmed with eight china silk bows in graduated sizes. All pieces were sewn by hand. There’s really not much else to say about construction since the tutorials are so detailed. I’m still not quite sure that trimming the sleeves with ruched ribbon rather than having cuffs was correct for the 1750’s, but I can use the fabric out of the curtain tiebacks if I decide to make cuffs in the future. I’d have to do a lot of piecing if I were going to try to do it with the scraps from the curtain panels. Because of the method of making the bodice by cutting out the armscye and folding/pleating the rest of it, this really did take practically all of the three lengths of fabric. I was able to make the matching petticoat without piecing in a different fabric at the top, but I did have to do a little piecing to make it work. I did not cut this with a train so that I could dance in it. I saw several online that were trained, which was appealing but not so practical. I wear this gown and petticoat over a chemise (Simplicity 3635), fully boned stays (Simplicity 3635), pocket hoops (Simplicity 4092), and two petticoats based on the same tutorials as the print petticoat. I love this dress. It was great to wear and had great range of motion for the arms. I had absolutely no problems dancing in it, even doing “The Duke of Kent’s Waltz” where the lady keeps turning under the gentleman’s arm. I am definitely looking forward to wearing it again at Holidays at Smithfield. I doubt anyone will mind the 1750’s gown at the 1770’s plantation! So pretty! I love how the pleats hang. It's splendidly gorgeous! Thank you for the construction notes as well. It's beautiful, but it cries out for lace cuffs to add to it for dress wear (and possibly a matching cap). Oooo, it's gorgeous! Motivation to start on mine. The pictures were taken when I was dressed for a ball, and I don't usually wear a cap to balls. I did wear a cap when I went to Smithfield Friday. I have to think about what I want to do with the sleeve ends. They could use something extra, but I'm really not sure what.